Olive wood pipes have long been considered to be sleeping gems. Superior to briar root in some aspects and not used by many artisans, makes for instant collector pieces and a fantastic addition to anyones pipe collection. In this article I wanted to give you some basic information and answer some of the common questions when it comes to Olive wood. 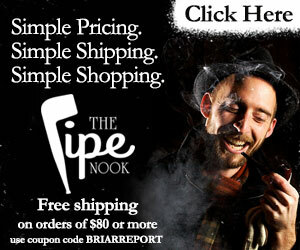 Briar is the most popular material for making pipes. Materials like Meerschaum, corn cobs and hardwoods such as cherry, olive wood, walnut and morta are also popular choices. When I started making pipes the materials used were maple and walnut. Over time when I felt more competent I sought another material to use. I’ve made some briar pipes which is what I started with but wanted to do something different. I felt everyone was making briar pipes so I sought out a material that was durable, safe and widely accepted as an alternative to briar. Olive wood, I discovered, has a rich history and unique properties for pipe making. Olea europaea, O. capensis, better known as Olive wood is a hardwood which is cream or yellowish-brown with darker brown or black contrasting streaks. The curly, widely spaced, wavy grain gives Olive wood that distinct look. The growth rings of the hardwood trees is what creates the grain patterns. Unlike Briar which is a root. Briar’s grain is not the same which is why you get some patterns like birds-eye. Olive wood is the quintessential hardwood. The uniformly distributed pores in the growth rings gives Olive wood its distinctive properties. . It results in a very durable and hard wood, which makes it an ideal choice for pipe-making. Working with olive wood presents only minor challenges. One aspect of the carving relies on the wood being mostly dry. Not being kiln dried presents unique problems like splitting, therefore Olive wood comes covered in wax. To date, I have never had an olive wood pipe split on me and as they are smoked they seem to become more durable. The second issue with the wood is that it is very difficult to achieve a perfectly smooth surface. When carving great care must be taken since any flaw will show up after the piece gets buffed with Tripoli and finally Carnauba wax. While making the pipe, one can enjoy the beautiful fragrance of olive oil which is very pleasant to the nose. Throughout the world you will find the availability of Olive wood limited. There are many factors for that. Compared to other hardwoods, Olive wood trees are slow growing and are quite small. It’s the fruit of the tree, the olive, where the economic importance lies. People love to eat olives, so it make no sense to cut the trees down. Wood usually comes from branches and non-producing trees. Olive wood is highly prized and sought for making high end furniture, veneer and small specialty items like kitchen utensils & cutting boards and yes, pipes. People say the best olive wood comes from Bethlehem therefore those prices are highest. I have never used this type of wood and rather use Roman olive wood which is less expensive and more readily available. I have to cut the blanks down to usable sizes since they come in 12″ lengths. Each batch of wood is different and presents with unique grain which is the uniqueness of olive wood. Interestingly, like briar, one doesn’t see the grain pattern until the carving and sanding process begins. Still admired today, most collectors want at least one Olive wood pipe in their collection. Almost all pipes you see now are handmade and the prices they fetch reflect that fact. When olive wood pipes are first completed, they are usually a very light beige in color with distinctive grain surrounding the bowl, shank and bottom of the pipe. There might be some darker areas than others in the grain but for the most part the pipe is light in color. When you smoke an Olive wood pipe the grain darkens. The grain pattern becomes quite pronounced. The pipes will build cake like a briar and break in very easily. I have never had a harsh olive wood pipe during the break in period or any other time for that matter. Olive wood pipes smoke very well as evidenced by the many pipes I have made for members of the pipe community. They smoke dry and there is no taste of “olive oil” in the smoke as some might suspect. None of my pipes have ever gurgled and I have never received any negative feedback from my buyers. I always encourage owners of my pipes to communicate any issues they might have with my workmanship or the quality of the olive wood. Seasoned pipe smokers love the smoking characteristics of my Olive wood pipes. In my observations I have never noted olive wood pipes to get any hotter than briar. In fact, to the contrary, I find olive wood actually smokes cooler. Regardless of the type of tobacco, none of the pipes I smoke heat up very much. Olive wood pipes are somewhat hard to find. There have been only a relative few carvers using Olive wood. 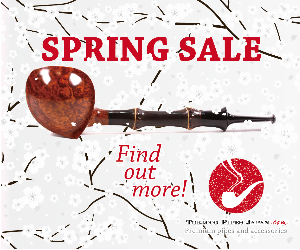 Olive wood pipes has become a scarce market. Finding new Olive wood pipes is even more of a challenge. Searching the thousands of pipes in a major online retailer’s website returned seven (7) results! Vermont Freehand is one company who manufacturers Olive wood pipes. Besides them, your options are somewhat limited. If you want a new Olive wood pipe you’re going to have to get one commissioned from a private pipe-maker. Anyone that owns an Olive wood pipe can tell you what a great wood it is. I highly encourage you to consider adding a one to your collection, or to expand what you already have. They really are the hidden gems of the pipe world. 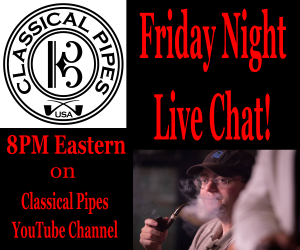 Best known as Olivewood Piper, Carl Petruzzelli can be found on Instagram and on on YouTube. Contact him by email at carlpetruzzelli@att.net. Carl makes high quality pipes produced from Olivewood and Morta (Bog Oak). High quality pipes hand crafted and sold for blue collar prices. Carl works with the customer to produce a custom pipe as close to the shape and stem color they want.